The end of May brings whispers of late spring, early summer activities and food. May is National Barbeque Month! Did you know? It took me nearly all month to come up with a killer barbeque (or bbq, for lazy orthographic artists). (n) bar·be·que: 1) a social gathering at which food is roasted over an open fire 2) a large animal (pig/cow) that is roasted over an open fire, spit, or pit. (v) bar·be·que: 1) to cook pork in a highly seasoned vinegar sauce. Pork. Always pork. No beef, no chicken. So...you can either go to a barbeque or eat it. But let it be known, that in the South, we eat barbeque. We don't go to one. We go to cookouts. Or just Cook Out. I took it upon myself to make my own barbeque sauce for all of the meat I plan on roasting over the next 3 months. The wonderful people at POM Wonderful sent me a case of pomegranate juice and I drank a good bit of it, but I knew I needed to save some for culinary purposes. 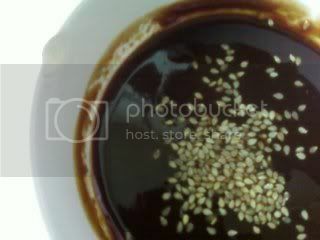 The sesame seeds were just for photogenic quality. Hey, it looked pretty. Reduce equal parts pomegranate juice and Cheerwine (cherry-flavored soda can be substituted here) by 1/2. Add 1 part ketchup, 1 part light brown sugar, 3 cloves of garlic (minced) and white pepper to taste. I used equal parts smoked salt, white pepper & my no-salt shake [a la Emeril] to rub down the ribs. I let them sit in the fridge for 8 hours before roasting. Low & Slow: the keys to great ribs. 275 F oven for 3 hours. 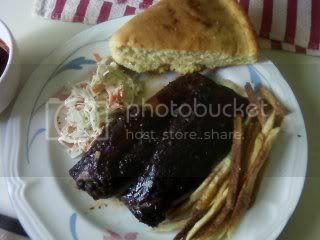 I basted the ribs after 90 min of cooking & had the sauce available or dipping at the table. Since I don't have my own grill in my tiny apartment, I have to cheat... A) use the stovetop smoker or B) use smoked salt. now that sauce sounds perfect. Okay, Cheerwine has really peaked my interest. family vacation to carolina? Nikki, this looks absolutely delicious. I'll have to try it. Have you ever had a dish famous up in Harem called Waffles and Chicken? 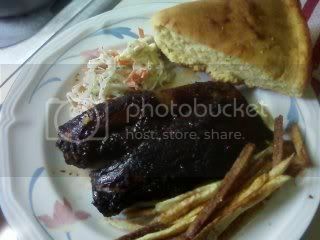 I just saw a special on Food Network (it was a Bobby Flay Throwdown) where this dish was served. The idea is really tempting. Mom: come on down! I'll show you guys around to all of the places that have good eats :) Pick a festival, drive on down! Teresa: I've never eaten chicken & waffles together, but I've heard of Roscoe's Chicken & Waffles in Harlem. I'm sure they're delicious...but I prefer biscuits with my chicken. I love that NC has a BBQ Society. It makes me think of people in fancy hats hashing out the minutae of hickory versus apple smoke, and about how much brown sugar makes the best crust. I love the sauce. I laughed reading the beginning the post about how it's only PORK, and then we see beef ribs. ;-) Those ribs looks mouth-meltingly delicious. I'm so with you on the no-barbecue in-the-apartment thing. I want your stovetop smoker though. My husband and I are in two separate camps. He like barbecue North Carolina style best. Me? Texas. Thanks heavens we agree on who to vote for or we'd really be in trouble! Yum, a pomegranate sauce sounds wonderful. And for me...pork...pork and BBQ just go together for me.